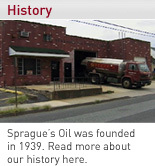 Sprague's Oil delivers only quality premium fuels. We also offer a convenient Budget Payment Plan. By spreading out your yearly fuel costs over 10 equal monthly payments, you can avoid the burden of high winter fuel bills. We have a new and convenient Budget Program to help you keep your monthly fuel bills down. Without a Budget Program 80% of the Homeowner's heating needs are paid during the five peak months of the winter. These 5 months are often made difficult because of the size of your heating bills. Now There is a Better Way! Small Monthly Payments. No Big Fuel Bills. We estimate your yearly heating costs and divide it into 10 equal monthly payments easily adapted to your family budget. The payment program starts in July. We automatically give you the 1 cent prompt payment discount on any deliveries that are made while the account is up to date. If your monthly payments are greater than your purchases, they can be used to reduce next year's payment, or refunded. If there is a balance due, it will be payable upon receipt of your final statement. There are no extra charges, nor hidden costs.